There was a flurry of activity as we broke camp this morning. We packed and loaded our bags, took down the tents and said our final goodbyes to the Safwa. We crammed into a couple of land cruisers and set out for the 2 1/2 hour drive to Mbeya. We dropped off the translators and Nelson and we headed off to lunch at the Utengule coffee plantation resort. 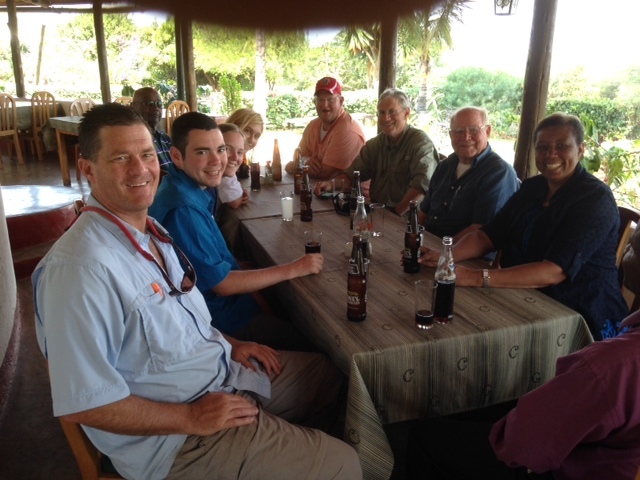 The atmosphere and food were great and we enjoyed some fellowship over a cold Stoney Tangawizi. Brianna made a critical mistake when she ordered the prawns. They were a little fishy and definitely needed some “Slap Yo Momma” seasoning. Bill’s philosophy is that he never orders seafood when he is more than 50 miles from the coast. This is especially true in Tanzania. Fresh fish transported by truck might not be so fresh. Apparently Bill has no prohibitions on where he will order Chinese food. His sweet and sour pork worked out just fine. 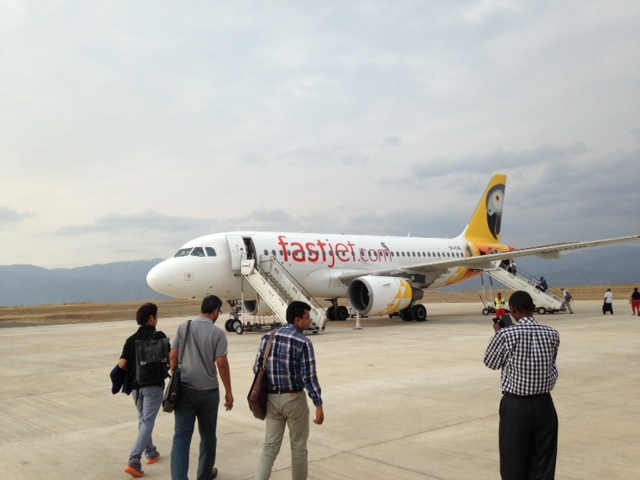 The Songwe international airport provided the first reliable connection to wi-fi since the Istanbul airport. Twinkle Toes was left out of the fun since he does not have a portable electronic device. This is our ride from Mbeya to Dar Es Salaam. A one hour flight is much better than a 16 hour car ride. 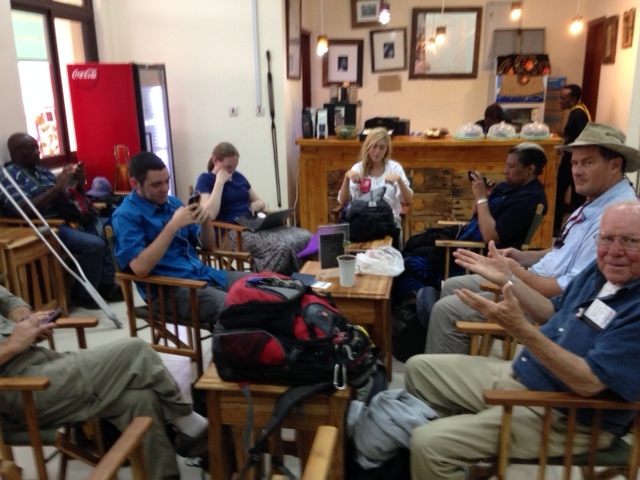 Getting from the airport to our lodging spot in Dar is always an adventure. We crammed 9 people and 12 bags in a Toyota van. It would have been tight with 7 people, but 9 people made it like a game of mobile Twister. The cramped quarters kept our minds off the traffic. We made it to the Tanzanite Executive Suites. For those TZ mission trip veterans this is a gigantic step up from the Cefe House or the Rombo inn. I showered for the first time in since I left Katy. 9 days is a new personal record for me. I was not the only one who did not bathe in Ifumbo. The shower felt great. We are all looking forward to a good night’s sleep. We leave for Zanzibar in the morning. What??? A flight from Mbeya?? Where was that two years ago?? That’s huge, to cut the 16 hour drive. I remember how good that first “real shower” felt. 9 days with no shower?? Really??? And you are proud of that? Hope you guys have some good needed R and R before the flight home. praying for your safe return!